If you've been around Scrumptious Street a while, you know I love Forbidden Rice. I'm always looking for new ways to make it and this Fall I was watching (Iron Chef America *blush*) a show which featured chefs cooking against each other. The challenger made my favorite forbidden rice and served it in a little pumpkin. It was so charming and inviting, I had to try it myself. With the abundance of pumpkins this autumn, it seemed appropriate. While I know for a fact my recipe is different -- I don't remember the chef nor their recipe -- I have just borrowed the presentation and worked backward from there. 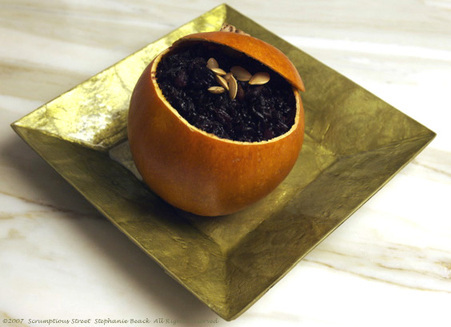 Here is my "Sugar Pumpkin Forbidden Rice". There could be many variations on how to do this, as well as usage of different kinds of squash or pumpkins. Hell, if I were you I'd try them all! Or, if I were me....The sugar pumpkin was sketchy, I must admit. I roasted it first, because that's what you do to get the best flavor out of pumpkins or squash. Well, after roasting these little guys I wasn't too impressed. Matter of fact, I almost threw them out. But, I hate wasting food and so I put on my best culinary creativity and rescued the pumpkin. I must admit, this turned out terrific!! A little thought to the balance of flavors on the tastebuds and I had a winner. They came in all sizes, I chose two that were individual serving sizes about as big as a large grapefruit. 1. Preheat oven to 400˚F. Wrap pumpkins individually in aluminum foil and set on a baking sheet. When oven gets to temperature, bake pumpkins for 1 1/2 hours. 2. Remove pumpkins and let cool slightly. Cut off the top (this is really, really hard, be careful not to cut yourself), scoop out the flesh and seeds with a grapefruit spoon. Wash and save seeds for a later toasted/spiced snack. Cut pumpkin flesh into diced cubes. 3. Add stock to a saucepan and bring to gentle boil. Add rice and reduce heat to medium-low and cook for 30 minutes, until the rice is nearly done. While rice is cooking, thoroughly wash out the pumpkin shells. 4. In another skillet, heat the butter and then add the onion. Saute the onion until it looks glassy and then add the pumpkin. Stir gently about 30 seconds and add the brown sugar, salt and pepper. Cook until the pumpkin firms up slightly, about 10 minutes. Add the fresh lemon juice and stir. 5. Add the cooked rice to the skillet with pumpkin, toss together and do a final seasoning check and adjust for taste. 6. Scoop the rice and pumpkin back into the pumpkin shells and serve. This tasty and beautiful dish was a great experiment that turned out just lovely. I must confess I had my doubts whether it would taste as good as I'd hoped while I was pulling it together. In the end, it was unique, delicate, fresh and tasty. Here's a look at my "Sea Scallops with Pomegranate-Currrant Juice and Cauliflower Puree". I know the ingredients seem an unlikely combination, but they really work tremendously well together. 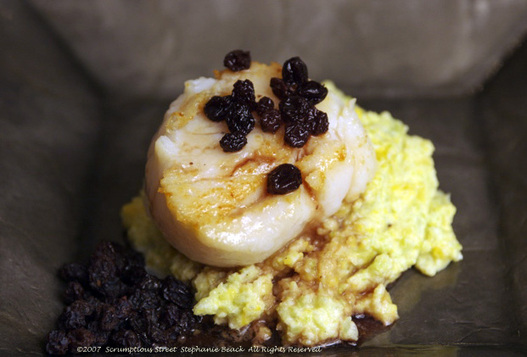 The juice and currants cut the richness and sweetness of the scallops down, the cauliflower is slightly salty and fresh. The result is just spectacular, as long as you promise to use incredibly fresh scallops! 1. Put the currants and pomegranate juice into a small saucepan and bring to a boil. Reduce heat to simmer and let reduce by at least half. 2. Cut the cauliflower into small pieces and place them in a saucepan. Add the butter and water. Cover the pot and bring to a simmer over medium heat. You want the water to only rise about 1/2 the height of the cauliflower. Simmer until the cauliflower is very soft and tender, about 6-7 minutes. Drain the cauliflower and then add to the bowl of a food processor. Puree until the cauliflower is very smooth. Stir in the heavy cream. Place in a bowl and set aside, keeping warm. 3. Put a large skillet over high heat and heat the olive oil to very hot. Add the scallops and sear 2-3 minutes on each side, forming a golden brown crust and cooking just through. Turn after the first side. 4. When scallops are done, quickly spoon the cauliflower puree onto a serving dish or plate, nestle three scallops on each plate (I only show one in my photo, it was more aesthetically pleasing) and drizzle the pomegranate-currant juice on top. Serve immediately! When I meet new people and tell them I love to cook, one of their first questions is always, "What do you cook? What are your specialties?" That is always such a difficult question for me to answer, kind of like I imagine it would be to tell someone which of your children is your favorite... I truly love cooking nearly anything and don't know if I have a signature dish or specialty. But, I can tell you that if I did, this may be one of them. Every time I see my best friend she recalls the time I made this dish for her. She has been politely reminding me to put it on this blog for over a year. 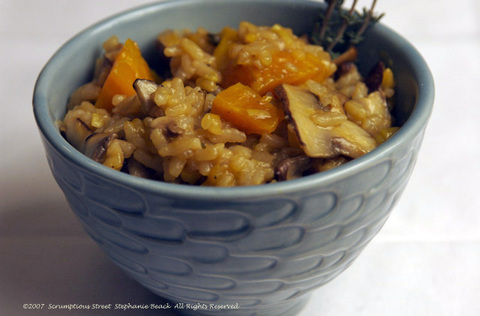 So, I guess one of my specialties must be this "Golden Beet and Mushroom Risotto." This, my friend, is for you. I'm sorry it took so long! We love this risotto because it is creamy and hearty, earthy yet sophisticated. It is easy and rustic with such a terrific combination of flavors that I always eat more than I should simply because it tastes so good. I have done variations on this before, but this is my normal approach to a golden beet risotto. As always, I begin by roasting the beets. It brings such a lovely depth and smoky sweetness to the root vegetable...I really love how beets respond to roasting. Here's the recipe, I hope you try it this season! 1. Preheat oven to 375˚F and roast beets with a coating of olive oil, sprinkle of kosher salt and ground black pepper in aluminum foil packets for 45 minutes to 1 hour, until fork tender. Remove and let cool, peel and dice the beets, set aside. 2. In a large skillet, heat the olive oil to shimmering on medium-high and sauté the shallot, leek and garlic for a few minutes until the shallots begin to turn soft. Add the rice and sauté until the rice begins to look glassy and translucent. Add the mushrooms and sauté a few minutes more. Season with a couple of pinches of kosher salt and three turns of the black pepper grinder. Toss in the thyme. 3. While that is sautéing add the vegetable stock to a small saucepan and bring up to steaming. You don't want to simmer or bubble, just get the stock good and hot with steam rising from the surface. 4. In the large skillet, pour in the wine and bring the rice and veggies to a boil. Then, immediately reduce the heat to medium-low and cover with a lid for about 4-5 minutes until half of the wine cooks away. 5. Remove the lid from the skillet and put in about one cup (one and half soup ladle) of the hot vegetable stock. Stir to incorporate, reduce the heat to low and replace the lid, covering tightly. 6. After about 10 minutes, check on the risotto and if nearly dry, add more stock. You should add the stock a bit at a time, only after the previous addition has cooked down and the risotto is moist but not wet. You must ALWAYS replace the lid between additions of stock. You also need to leave that lid in place for at least 10-15 minutes and not continually peek or stir. These are the tricks to succulent and moist risotto. It only becomes dry and chewy if you work it too much, let the temperature vary too much between high and low, and if you cook it too quickly. 7. This entire process of cooking covered and adding stock will take anywhere between 20-35 minutes, depending on your stove and cookware. Listen the entire time, you don't want the risotto to ever cook dry, but slowly and gradually cook and incorporate the stock gently. When the risotto is al dente yet tender, turn off the heat and gently add the beets. Stir thoroughly and taste. I like my serving of this risotto very peppery, so I always add a couple more hearty turns of the black pepper grinder. This is up to your own taste, of course. But, make sure to taste and add any additional salt or pepper at the end. Serve immediately. I hope you like my recipe as much as my friend does. And, as much as I do. And, Mr. Scrumptious!